Lutron shading solutions offer quiet, precision control of window treatments for convenient daylight management while saving energy and enhancing décor. Lutron drapery track systems electronically operate a variety of styles, including pinch pleat and ripplefold, in addition to the innovative Kirbé Vertical Drapery System. Roman shades lend an air of sophistication to any space while managing daylight. 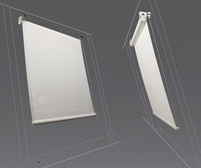 Offer the quality and quiet movement that a Lutron drive delivers by specifying a Roman Shade fabrication kit. Wood blinds are an attractive and effective way to ensure privacy while still allowing daylight to filter into a space. These blinds maintain uniform tilt and lift positions across blinds and combines smooth, quiet motion with independent control of lift and tilt. Lutron Wood blinds feature presets to recall a predetermined position and tilt for the ultimate in performance and style.